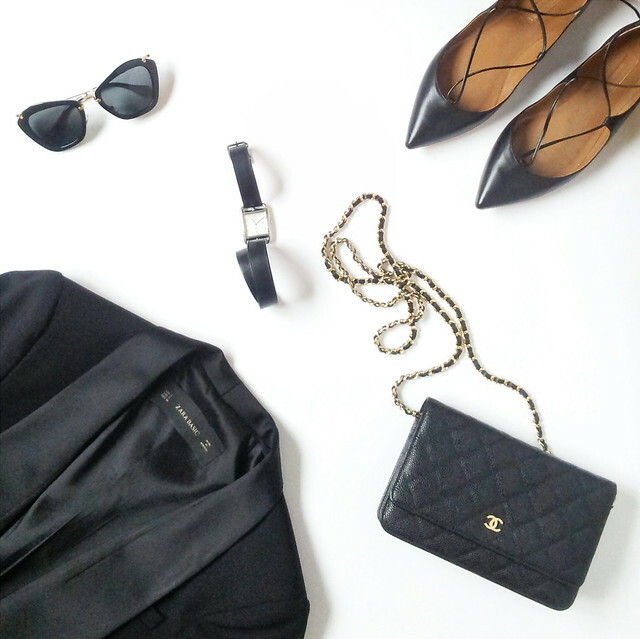 Clockwise: Miu Miu sunglasses, Aquazzura Christy ballet flats, Chanel WOC, Zara tuxedo jacket, Hermes Cape Cod watch. I used to answer with lightning speed that my favorite color was blue but let's face it, I'm garbed in black head to toe most days. I had my colors analyzed nearly 2 decades ago. Black's definitely my color, particularly over the colder 6 months of the year when my pale skin matches a vampire's. I've included a couple of new purchases on my favorite "black" list; the tuxedo jacket from Zara and the "Christy" ballet flats from Aquazzura that I've been drooling over the last 2 months. I've been searching high and low for a well fitted tuxedo jacket that doesn't cost the earth. The Stella McCartney "Melissa" jacket fits like a dream but it was slightly too long for a shorty like me. The price made my eyes water too. The one from Maje was made of rather flimsy material. The shoulder of another from Claudie Pierlot was far too narrow and lumpy. I could go on...... However, every now and then, I manage to unearth a treasure from Zara like this tuxedo jacket with a rather eye-catching piping along the hem. I nabbed a pair of Aquazzura Christy flats a couple of weeks ago before they were sold out everywhere. I rarely pay retail for shoes especially if they're in the high 3 figures. After tossing and turning, humming and hawing over these gorgeous pointed flats for the last month, I decided to bite the bullet and get them anyway. I'm over classic ballet flats these days. You know me and my obsession with statement shoes, particularly ones that are comfortable. Forgive my sweet and short posts this week as I have family visiting over the school term break. I'll be playing tour guide (one that has a shocking sense of direction). If you see an Asian lady looking rather lost leading a gaggle of kids and a couple of adults in London, come and say hello. It'll definitely be me.